DETROIT — Andreas Athanasiou got the Detroit Red Wings' offence going, and Jimmy Howard backed it up. 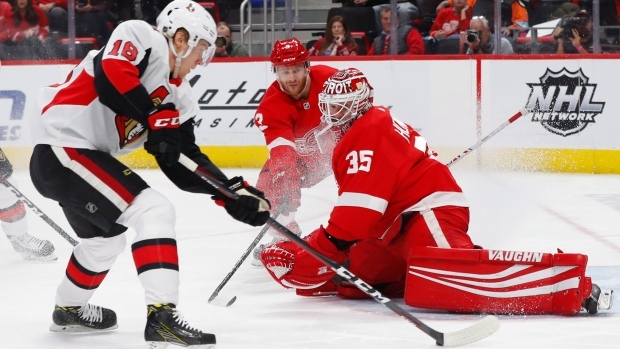 Athanasiou scored twice, including a penalty shot, and Jimmy Howard made 40 saves in his 500th game to lead the Red Wings to a 3-2 win over the Ottawa Senators on Thursday night. Frans Nielsen scored to break a 2-2 tie late in the second period. "(Athanasiou) doing what he does best in the first period, Frans burying one in the second, that's all we needed tonight," Howard said. "It was nice." Howard joined Hall of Famer Terry Sawchuk and Chris Osgood as the only goalies to play 500 games with the Red Wings. "I think one of the biggest things is he's never satisfied. He's always looking to get even better," Detroit defenceman Niklas Kronwall said about the 34-year-old Howard. "I don't know if I've seen him play better than he has this season to be honest with you. It's pretty impressive." Brady Tkachuk and Matt Duchene scored for Ottawa, and Anders Nilsson stopped 26 shots. "We gave Athanasiou two breaks. So we know you've got to two-man that guy. You can't expect on your own to be able to catch up to him," Senators coach Guy Boucher said. "We got beat there 1-on-1. There's no defensive mistake there. It's just 1-on-1, one's faster than the other. And then the other one, we left the middle open there a little too long, and he took advantage of it, and he got a penalty shot." Nielsen got the winner with 3:00 left in the second period. He got his ninth goal, from the bottom of the left circle, by converting a pass from Darren Helm after a turnover by Senators defenceman Dylan DeMelo. Duchene had tied it at 2 with 6:21 left in the second. He skated around Detroit defenceman Jonathan Ericsson and beat Howard for his 26th goal. The Red Wings led 2-1 after the first period. Athanasiou scored his first goal with 9:16 left in the first. He cut in off left wing, skated across the crease and beat Nilsson with a backhand shot. Tkachuk tied it with 3:36 remaining in the opening period when he put in a loose puck from in front. It was Tkachuk's 13th goal. Athanasiou restored Detroit's lead when he scored on a penalty shot with 2:18 left in the first. Ottawa defenceman Christian Jaros impeded Athanasiou on a breakaway attempt. It was Athanasiou's career-high 20th goal and third in two games. NOTES: The Red Wings sent rookie defenceman Dennis Cholowski to AHL Grand Rapids after the game. Cholowski had seven goals and 16 points and was minus-20 in 52 games. He was a healthy scratch for the second consecutive game on Thursday. ... Ottawa was without G Craig Anderson (eye) and D Mark Borowiecki (lower-body injury). ... The Red Wings lead the NHL with four penalty shot attempts this season. They've been successful on two (both by Athanasiou), which ties the Vancouver Canucks for the league lead. Senators: At Winnipeg on Saturday night. Red Wings: At Philadelphia on Saturday night.